Now that thing’s have settled down a bit (famous last words) it’s time to start thinking about a new foster dog. It’s been a while since I’ve had a foster, though the temporary pups have kept us nicely on our toes! I think we’ll be ready when the time is right to bring a new four-legged kiddo home. I’ve gained so much new knowledge in the past few months that I think will really help me with my next foster, whoever it ends up being. There are others in my house, though, that have not learned quite as much as I have recently. Because shaping a dog into the “perfect” little household family member takes lots of consistency, I want to make it easy for everyone in my house to be on the same page. I wrote up a quick page of *things to remember* about having a dog that I think will help provide more structure for the new pup we bring home. It’s not necessarily that these things alone will help a new dog learn manners, but following these simple steps as well as additional training will set the pup up to be the best she can be. If you or anyone you know is bringing home a new dog, along with a list of guidelines for everyone in the house to follow, I would recommend the books The Other End of the Leash and Love Has No Age Limits by Patricia McConnell. Both of them touch on the pointers on my own list as well as much, much more. Bringing a new dog home can and probably will be a stressful experience – being prepared can lessen that stress a bit! This entry was posted in Dog talk, Rescue/Humane Society and tagged behavior modification, dog training, family, house rules, new dog, new foster dog, Patricia McConnell, positive reinforcement, positive training, training tips. Bookmark the permalink. Great post! I did something similar with my husband before I started fostering (It’s just him and I for now). Plus anyone who comes over normally gets a mini briefing on the “what to do/not do” around the pups since I usually get dogs that need a little “help” and some confidence building. I also agree with the book references, they are both great! 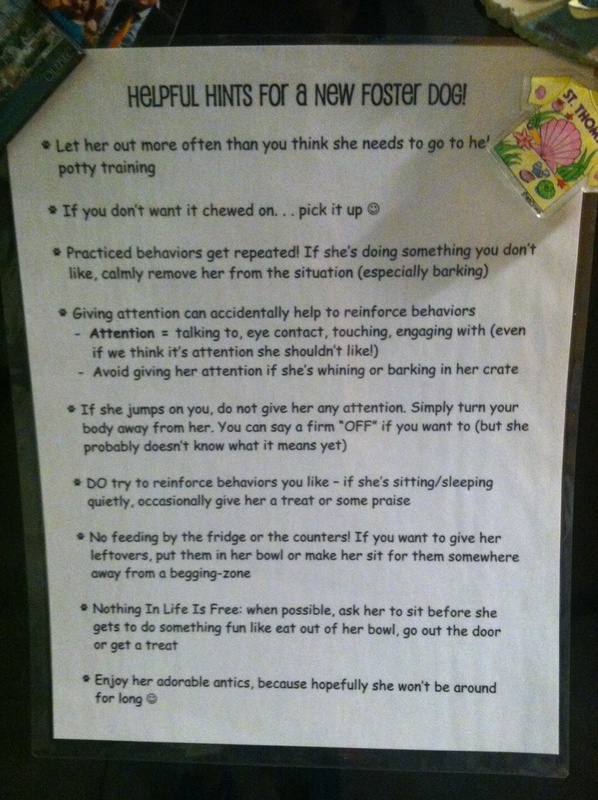 Love this….now if only I could get the hubs to read it and understand that I’m not just constantly nagging at him when he strays from the rules, but that it benefits the dogs. LOVE! You’re so organized! Would you consider making this a PDF so others could simply print for their fridges??? Great list – a must read that should be given to every pet parent. Great idea! Love the list! This is really good. I feel like we’ve become so comfortable with our own dogs, that sometimes there are things we forget when bringing in a new pup. I second the PDF idea! What a great and informative post. My husband and I got our grandsons a pup and were wondering if we should bring it to our house first at 7 weeks old…let it have some time with our dog and get used to being away from mom and siblings before taking her to the boys or just go to the boys cold turkey. We are a big dog family and have been raising and training working dogs for years but have never given a dog to someone. What’s your opinion on how to make it easiest for the pup?